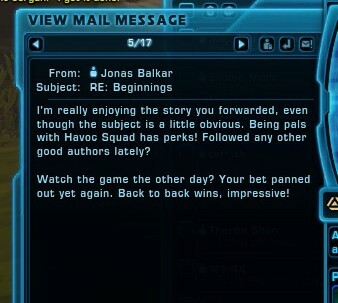 This mail is from Jonas Balkar, who you’ll remember is in Republic SIS. Now, when I saw this, I thought, “Hmm, this is a weirdly-worded message. It must be in code.” And sure enough. Using the subject line as a clue, I realized it was the first word of each sentence, or the “beginnings” of each sentence. Some of you might be thinking, “well, duh, I figured that out instantly,” but hopefully, this is a cool thing some of y’all didn’t notice, and you’ll chuckle at the level of detail that went into this particular email. 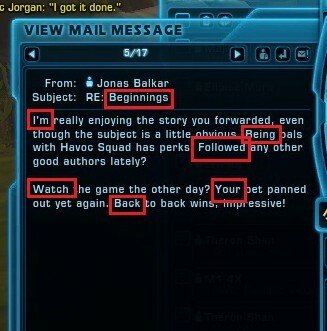 Have you found any really interesting emails from in-game NPCs? Let me know in the comments! Wow that’s really cool! I need to slow down and pay more attention. I need to as well! Sometimes I get lost in the math and don’t notice the art. How creepy! I do read the messages, but I’m pretty sure I never would have figured that out, heh. Glad you enjoyed it! Or at least were creeped out by it!